There are no fees and deposits are 100% refundable for layaway items. 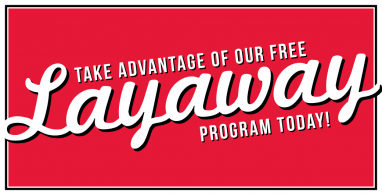 Layaways require a minimum deposit of 25% of the purchase price, with 60 days to pay the balance and pick up. Layaways that have reached 60 days are subject to cancellation. The item(s) will be released and the deposit will be placed as a fully refundable credit on account in your name. Some items may not be available for layaway.